This is my White Garden, also known as "Garden of Weeden." In the background, Babies the dog gets into the picture; she is always ready to pose for the camera! All the flowers in this bed are white. I placed a silver gazing ball, in a glass container (filled with sea shells) right in the middle of a bird bath. My garden elf (with the red cap) is carrying his fishing catch and watches over the garden. 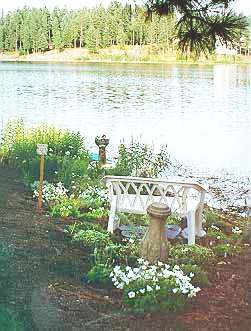 In the Spring the lake can flood part of this garden; when I first planted it the lake was at least six feet away! 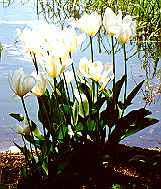 These white tulips were almost underwater in the Spring of 1996. This is a view of the White Garden looking down the hill toward the lake. 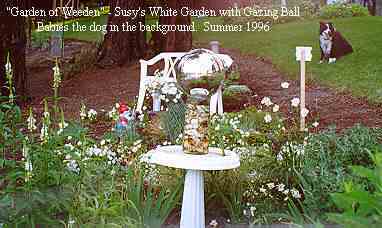 There are many different plants with white blooms, it is fun to collect them into one garden, but a challenge to make them into a continuous cohesive garden display. The Round Garden is NEXT on this tour.